​Over 35 years of experience as your water heater expert. New residential and commercial water heaters plus installation. Repair of all makes and models of water heaters. Warranty service. Gas, electric, tankless, and propane water heaters. Removal of old water heater. 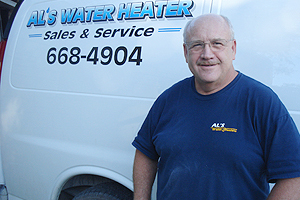 Al&apos;s Water Heater Sales & Service is a family-owned and operated business. It&apos;s our goal to make sure you&apos;re 100% satisfied with the customer service and the workmanship you receive from any member of our team. The size, or severity of your water heater&apos;s problem is no issue for our experienced team. With over 35 years of experience in serving the Ann Arbor area, we&apos;ll be sure to have it fixed. You will always be able to count on us to be there for you during your water heater emergency. Call us at 734 668 4904 and we&apos;ll help you immediately with instructions and be there as soon as possible.